John Markey is currently writing his PhD on music and sectarianism in the West of Scotland under the supervision of Prof. Martin Cloonan. I was recently asked by a colleague to take part at a weekly Community Learning Group in Rutherglen, attended mainly by retirees and run by the local council. The idea is to present the attendees with discussions on new and interesting topics, challenge existing held views and promote dialogue amongst members of the older community. I was asked to give a talk on work I have been doing on behalf of the Janey Buchan Political Song Collection based at the University of Glasgow, which contains thousands of political songs dating from the early 1800s right through to today. I was tasked with finding and collecting as many songs written during and about the 2014 Scottish Independence Referendum as possible. My search culminated in a total of 91 songs being collected, a staggering number for a political campaign. The vast majority were in favour of Scottish Independence, with some written in support of a No vote and even some songs that took a neutral stance on the outcome. I have given several talks on the project and am currently in the middle of writing a journal article on the topic. A concert in support of Scottish independence helf at the Ushers Hall in Edinburgh shortly before the independence referendum. Even though I deliver lectures on political music at the University of Glasgow as well as cultural theory and musicology at the SAE institute in Glasgow and have presented at many conferences, this was my first foray into a community-learning environment. This required a less academic approach and a necessity to provide engaging content that was accessible. Another challenge was the political nature of the topic: everyone in the group will likely have voted in the independence referendum and while it was a generally good-natured if not robust referendum, it would almost certainly be the case that both sides of the vote would be represented there. I felt that being too cautious, however, may stifle debate and was prepared to prompt discussion with some potentially controversial (and polemic) statements on the topic. Overall the talk went exceptionally well – to the extent that I only got through the first half of my presentation. The attendees were very interested in the presentation and the discussion was very active. 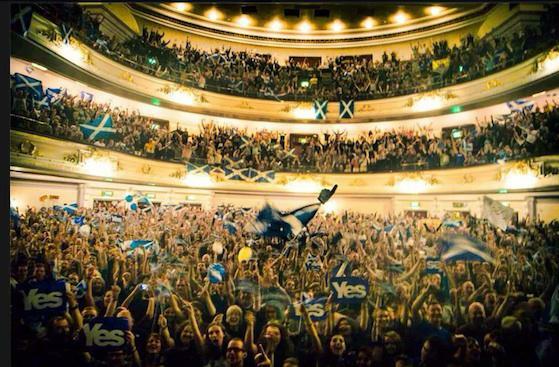 To my surprise (given the demographic of the members of the group) the majority voted for Independence in 2014 and were very interested in the music used. I did alter my presentation style, using less academically technical language, not referencing academic work on the topic and inviting interruptions to be made whenever someone had something to say. The expected controversy didn’t materialise: while both sides of the debate were present everyone seemed to be more interested in the topic in question than debating the referendum result proper. I have been invited back to present again, this time on a more controversial topic, the focus of my PhD: sectarianism in Scotland. This will no doubt provoke a more heated debate amongst the attendees. However, the desire to learn, query and socialise amongst the aging community in attendance will no doubt result in cooler heads prevailing. I’ll soon find out.